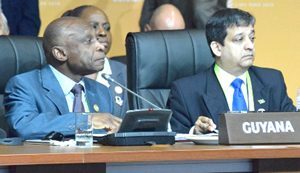 Foreign Affairs Minister Carl Greenidge has reiterated Guyana’s commitment to combat corruption. While addressing heads of states and delegations of the Organisation of American States (OAS) at the Summit of the Americas on Saturday, the Minister shared that Guyana has taken concrete measures nationally to eradicate corruption in all of its forms in an effort to build a more prosperous, safe, sustainable and democratic society. “Guyana has implemented several laws and regulations to strengthen its legal systems and institutions in order to investigate, prosecute and deter corrupt acts,” he noted. Narcotics trafficking and government corruption are the primary sources of laundered funds, according to the March 2018 International Narcotics Control Strategy Report (INCSR) released by the U.S. Department of State Bureau of International Narcotics and Law Enforcement Affairs. Although the Government has demonstrated a strong political will to combat the trafficking of narcotics in and through the country, the report also found that drug-related corruption is evident in the criminal justice system and other sectors. Greenidge highlighted the passage and ascension of the State Assets Recovery Act in May 2017 which he stated embodies the anti-corruption thrust of the state. The Act, which is predicated on the 2003 United Nations Convention against Corruption will engage in international cooperation in the recovery of stolen assets of the states. It was noted that the introduction of the Protected Disclosure Bill and Witness Protection Bill are aimed at combating corruption and other wrongdoing by encouraging and facilitating disclosure of improper conduct in both the public and private sector. The Foreign Affairs Minister told the Heads of State, that his country has embarked on several public awareness sessions to educate communities and engage stakeholders on the extent of the legislation and bills aimed at tackling corruption. He also noted that Guyana has made “significant progress” towards the preservation of an effective Anti-Money Laundering and Countering the Financing of Terrorism Act (AML/CFT). “Corruption hinders economic growth and development,” he said. The Minister said Guyana is committed to enhancing partnerships at the regional and international levels to eradicate corruption in all its forms. “I therefore, take this opportunity to reiterate my Government’s commitment to the strengthening of the anti-corruption mechanisms and strategies in keeping with anti-corruption treaties to which we are signatories,” Greenidge stated. Those treaties include the United Nations Convention against Corruption (UNCAC) and the Inter-American Convention against Corruption (IACAC). According to Greenidge, effective governance and institution that are accountable and transparent while being headed by strong leadership are important to eradicating correction. The World Economic Forum estimates the financial cost of corruption equals more than five percent of global GDP (Gross Domestic Product). “Combating illicit financial flows, capacity building in public administration and encouraging partnership with the private sector as well as the inclusion of strong and active civil society actors are steps towards this end,” he said. This year’s Summit of the Americas is being held under the theme “Democratic Governance against Corruption” and concluded yesterday, with the adoption of the Lima Declaration by the OAS Heads of States.